I recently acquired 7 theatrum mundi marionettes and a poster of the 'Grand Theatre Mecanique Frere Morieux'. All marionettes, except one, are complete. 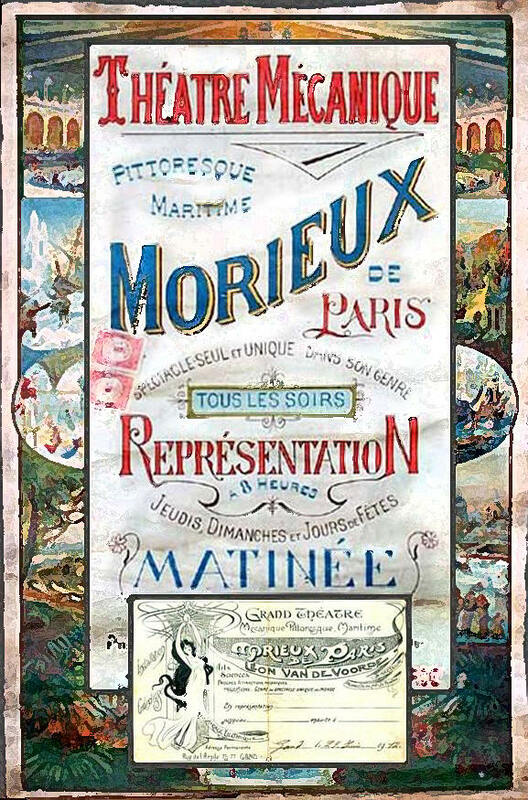 Click here to learn more 'Grand Theatre Mecanique Frere Morieux'. - The Morieux images on this page show an additional image or the illusion of movement on-mouse-over. - All Morieux images can be seen in larger photographs on the Google Group when clicking the respective images via the Morieux webpage. The group of 12 soldiers is most special because painted on both sides! In the theatre notebooks I also purchased (1876) I found several drawings of what seems to be the theatre construction to operate the marionettes. To see this, move mouse over the academic drawing and subsequently click the image to see a larger scan in my Google group. Further information on the Grand Theatre Mecanique and other early fairground shows is most welcome. The nice thing is that this fairground attraction is both related to Paris and Gent. The Théâtre Mécanique Morieux arrived for the first time in Gent round 1810. This mechanical Theatre (Theatrum Mundi) was founded by engineer Morieux, based in Paris, and became also successful on Belgian Fairgrounds, exploited by painter Léon van De Voorde round 1888. Their mechanical Fairground show became famous for it's moveable mechanical marionettes made in painted iron, the main characters of the show. In 1890 the Morieux theatre attended the Fairground in Kortrijk, Belgium, and offered most successful shows to the visitors: 'A visit to the World Fair in Paris', 1900, became one of their most popular attractions on Belgian fairground.